Atari 2600 programmer Manuel Polik has released the source code and binaries to Star Fire. 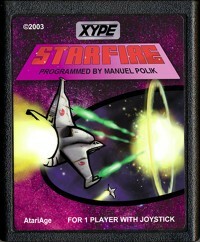 Star Fire is a new Atari 2600 game based on the 1979 arcade game of the same name created by David Rolfe and Ted Michon and released by Exidy. Star Fire is a wave-based space shoot'em-up, with several surprises that you won't find in the original arcade game. It carefully tries to not only adopt most features of the original, but to enhance the gameplay where ever possible as well. Title tune and warp sequence by Paul Slocum! Animated title screen by Thomas Jentzsch! Realtime calculation of up to 9 double sized, independent moving space objects! The source code below provides valuable insight into what it takes to code a successful Atari 2600 homebrew game. The current source compiles to both NTSC and PAL with a compile switch. We thank Manuel Polik for making this source available so others may benefit from his experience.